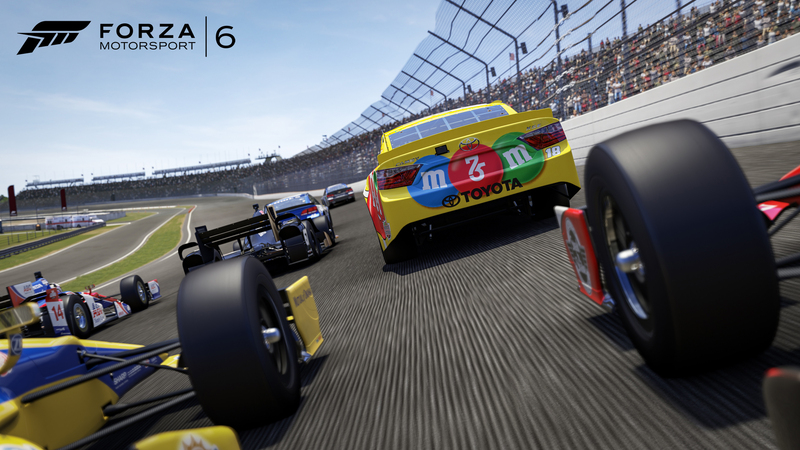 America’s most popular form of motorsport is coming to the best-selling racing game of this generation. 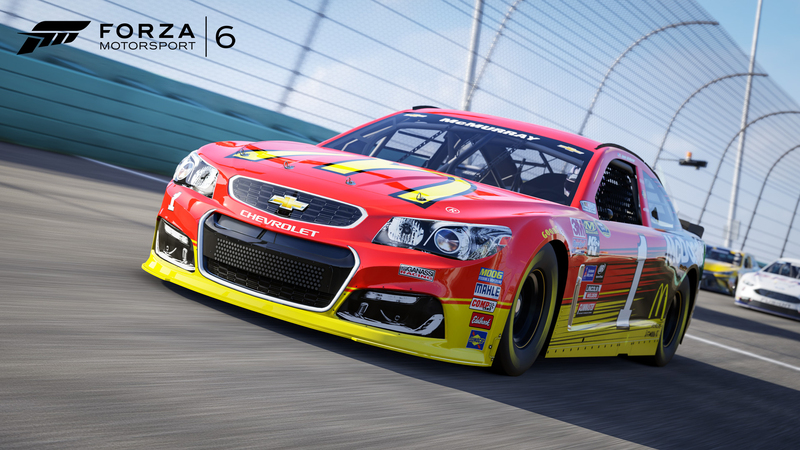 The NASCAR Expansion for Forza Motorsport 6 arrives today, bringing NASCAR to the world stage. This is an experience that only the comprehensive world of Forza Motorsport can deliver. The expansion features an all-new NASCAR World Tour career with over 10 hours of racing, representing the ultimate “What if…?” for racers around the world. How would American stock cars fare against Australian V8s at Bathurst, or against WEC prototypes at Le Mans? 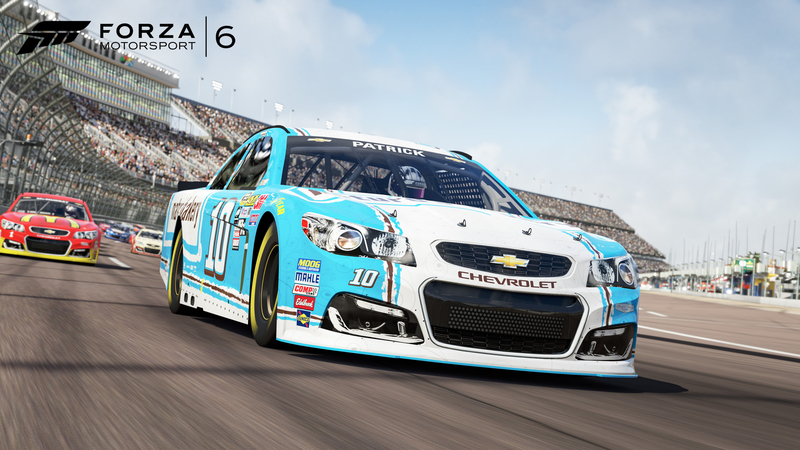 With the NASCAR World Tour career, players will be able to live these fantasies and answer those questions for themselves, competing in unique events across the cosmopolitan lineup of tracks and circuits in Forza Motorsport 6. Whether battling it out against GT and endurance racers from the world’s top motorsports leagues, sharing the track with open wheelers from IndyCar and Formula E, or testing the limits on classic American ovals like Indianapolis Motor Speedway and Daytona International Speedway, this is NASCAR like you’ve never experienced it before. The intensity of driving these quintessentially American race cars is at the heart of the NASCAR Expansion experience. 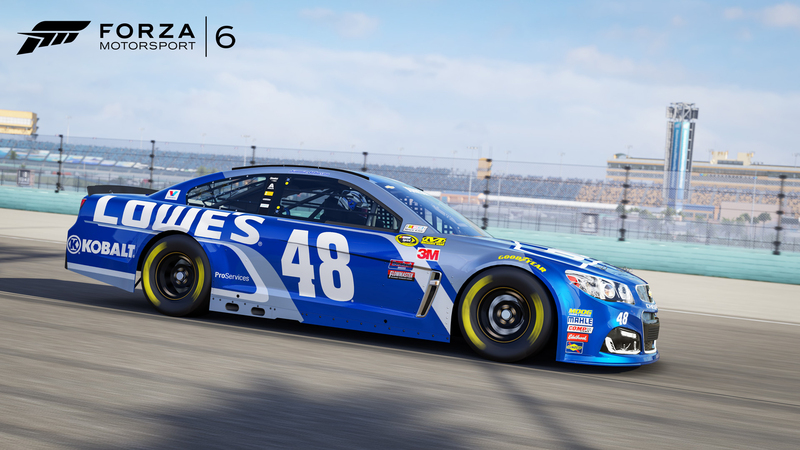 Players will be able to drive twenty-four 2016-season NASCAR models from teams like Joe Gibbs Racing, Chip Ganassi Racing, Stewart-Haas Racing, Hendrick Motorsports, and Team Penske, including the cars of top-flight NASCAR drivers Jimmie Johnson, Kyle Busch, and Chase Elliott. Johnson, Busch, and Elliott also serve as the stars of the “Voices of Motorsport” in the NASCAR Expansion, introducing fans to the history and technology of NASCAR. 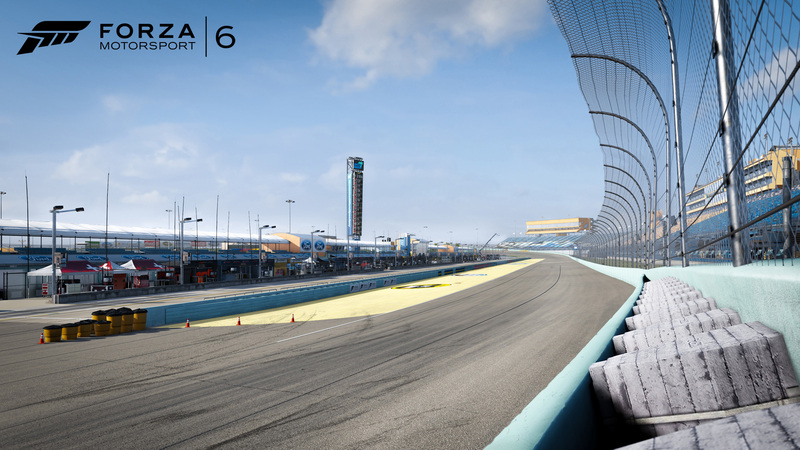 Along with the new career mode and lineup of new cars, the NASCAR Expansion also includes a new destination – Homestead-Miami Speedway, available in all modes of play – as well as NASCAR-themed Rivals, Leagues and multiplayer hoppers, giving players the chance to experience NASCAR across the entirety of Forza Motorsport 6. 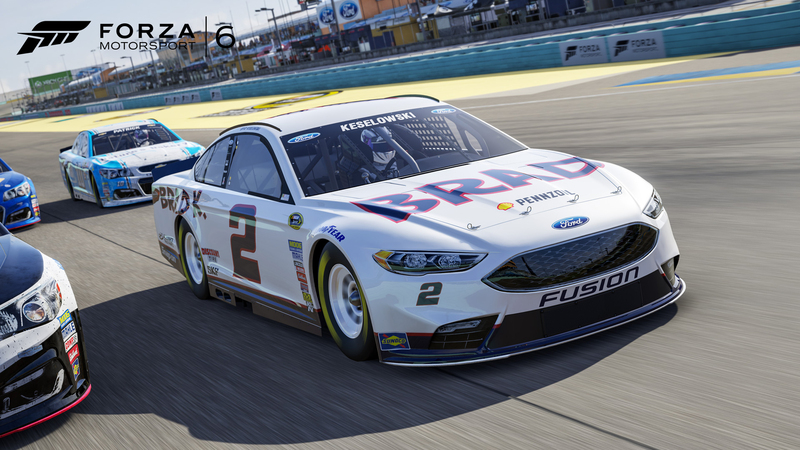 And with the addition of brand new features such as rolling starts, a new Quick Stop mode, and a more complex drafting model, the NASCAR Expansion adds new levels of strategy and tension to pack racing in game. 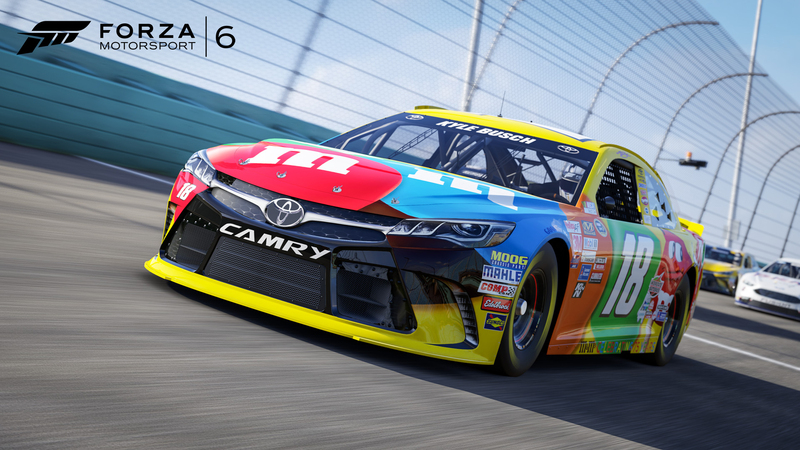 Get ready for a whole new way to race with the Forza Motorsport 6 NASCAR Expansion – Buy it now for $20, only on Xbox One. Chip Ganassi has a deep history in racing, winning his first race at age 18 in a Formula Ford. Ganassi raced in CART and in sports cars with success before buying into Patrick Racing in 1988 and later forming his own race team, Chip Ganassi Racing (CGR), in 1990. Since then the team has grown from a single CART entry to two cars in the NASCAR Sprint Cup and two in the NASCAR XFINITY Series, four cars in IndyCar Series, two cars in in the WeatherTech United SportsCar Championship, two in the World Endurance Championship, and two Global Rallycross teams. Together these teams have collected 18 championships and more than 160 wins. In NASCAR you will find Jamie McMurray driving the Chevrolet #1 McDonald’s/Cessna Chevrolet SS and Kyle Larson behind the wheel of the #42 Target Chevrolet. Whether you associate Joe Gibbs with his storied NFL coaching career – where he took the Washington NFL team to three Super Bowl titles – or his NASCAR racing teams which have earned four Cup Championships, winning is the common factor. Joe Gibbs Racing operates four NASCAR Sprint Cup cars with Denny Hamlin driving the #11, 2015 Sprint Cup Champion Kyle Busch behind the wheel of the Toyota #18 Camry, Carl Edwards in the #19, and Matt Kenseth in the #20. Debuting in 2009 as an owner-driver, three-time NASCAR champion Tony Stewart partnered with Gene Haas, founder of the largest CNC machine tool builder in North America, to form Stewart-Haas Racing. The team has built itself up to run four teams in the NASCAR Sprint Cup series. Danica Patrick is currently the only female driver in the NASCAR Sprint Cup Series piloting the #10, Stewart races the #14, Kevin Harvick is in the #4, and Kurt Busch drives the #41. All the Chevrolets are powered by Hendrick Motorsports engines. Since 1984, Hendrick Motorsports has earned a record 11 car owner championships in NASCAR’s premier division, the Sprint Cup Series. The organization fields four full-time Chevrolet teams on the Sprint Cup circuit with drivers Kasey Kahne (No. 5), Chase Elliott (No. 24), Jimmie Johnson (No. 48) and Dale Earnhardt Jr. (No. 88). Team Penske is one of the most successful teams in the history of professional sports with 28 National Championships across open-wheel, stock car and sports car racing competition. Known by his nickname “The Captain,” Roger Penske has been a cornerstone to racing for more than half a century. Team Penske’s NASCAR Sprint Cup driver lineup includes Joey Logano in the #22 and teammate Brad Keselowski, 2012 Sprint Cup champion, driving the #2. Born in the aftermath of Hurricane Andrew, which devastated the area in 1992, Homestead-Miami Speedway was built as part of the region’s reconstruction. The original layout was a rectangular oval modeled after Indianapolis Motor Speedway. However, due to the track’s shorter length (about 1.5 miles) passing was difficult and made for dangerous crash angles. After attempts to widen the aprons did not resolve the problems, Homestead received a massive reconfiguration in 1997, turning the track into a true oval. Further renovations such as improved banking and lighting for night racing have made it not only a fan favorite, but the home of the NASCAR championship races since 2002. The track also features a road course for sports cars, making Homestead-Miami a justifiably famous and inarguably sunny racing destination.